Have you suffered from veggie envy? An intense urge of wanting a vegetable someone currently has in their possession. See, totally real. Since we’re all about trust and honesty around here, let’s examine a real-life case study (me! ), shall we? Summertime in Florida is miserable. Okay, don’t get me wrong. There are gorgeous beaches (packed with vacationers) and endless sun. Doesn’t sound so bad. Both perks are 90% of the reason I call Florida “Home Sweet Home”. The other 10% being divided up between the fact that Dustin lacks a desire to move (it’s okay honey, I’m stickin’ with you) and I simply can’t live without my mom. Yep, I’m nearly thirty years-old (3 months and 16 days away) and I’m admitting that I desperately need my mom, and her famous banana bread. I heart you, Mom! It’s not all sandals and sandcastles. Florida has her flaws in the summer: roaches (the size of your hand! ), heat that will singe the hair off your arms, and a lack of anything green. Sounds like winter in the rest of the country (except the roaches and intense heat). While we Floridians enjoy the beaches and “warm” weather, the rest of the country (according to my friends’ Facebook updates and the 838 people I follow on Instagram) enjoy cool mornings on wood decks and afternoons in gorgeously full green gardens with cute picket fences. The pictures of giant baskets full of garden-fresh cucumbers, fist-sized tomatoes, and squash leave me with an intense craving for fresh-from-the-garden veggies. That’s when the veggie envy kicks in and it’s intense. How does one treat and ultimately cure a case of veggie envy? After picking the bounty, homemade goodies are in order. The floral apron is tied and the happy work begins…canning, pickling, dehydrating, baking. Of course, one of the veggies in the fresh bounty is zucchini. 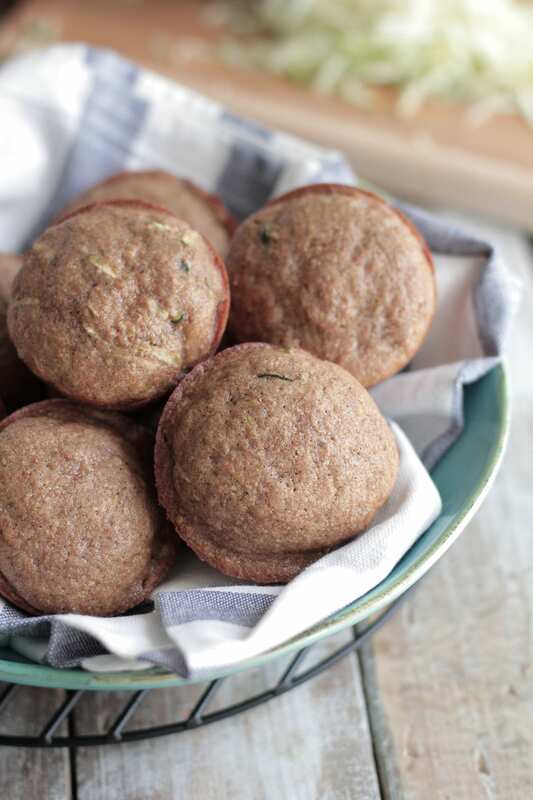 When zucchini runneth over, muffins ensue. 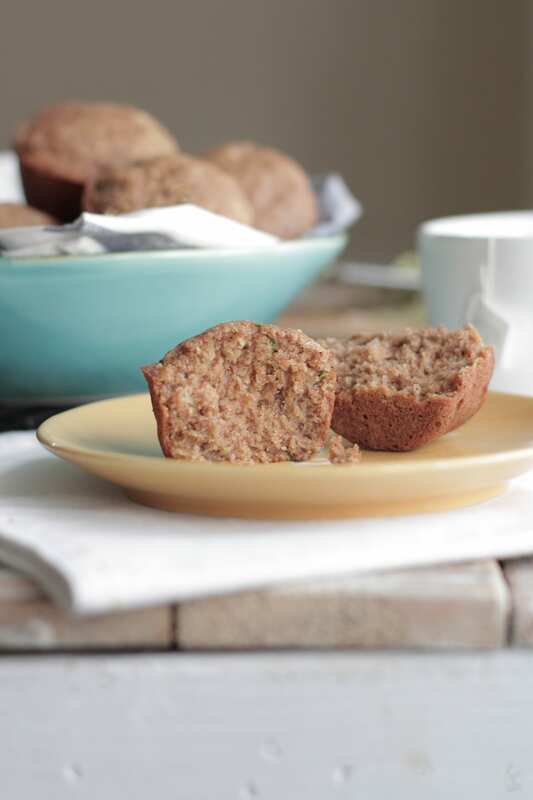 Chai Zucchini Muffins are not your average zucchini muffin. These little baked gems are naturally sweet and moist, with the subtle flavor of a rich chai latte (without the $4 cost). After harvesting a great veggie bounty a one bowl wonder is exactly what’s needed. Rest assured, friend, these fancy little muffins meet that need and go above beyond… delivering a warm tray of happiness without a mess. A satisfying reward for successfully treating a fierce case of veggie envy. In a stand mixer with the paddle attachment (or a large bowl and wooden spoon) beat the butter, honey, and sucanat together until creamed. Add the whole milk, vanilla extract, and eggs. Beat together. Add the flour, baking powder, baking soda, salt, and remaining spices to the butter mixture. Beat the ingredients together. Spoon the mixture into a muffin tray. Bake for 25-28 minutes. Disclaimer: If veggie envy symptoms persist longer than seven days please visit your nearest farm for immediate treatment. And please bring me along! I love the combination of chai spice and zucchini! I don’t see chai mentioned in the ingredients. I first thought it was chia and looked again and saw it had the i and a reversed. 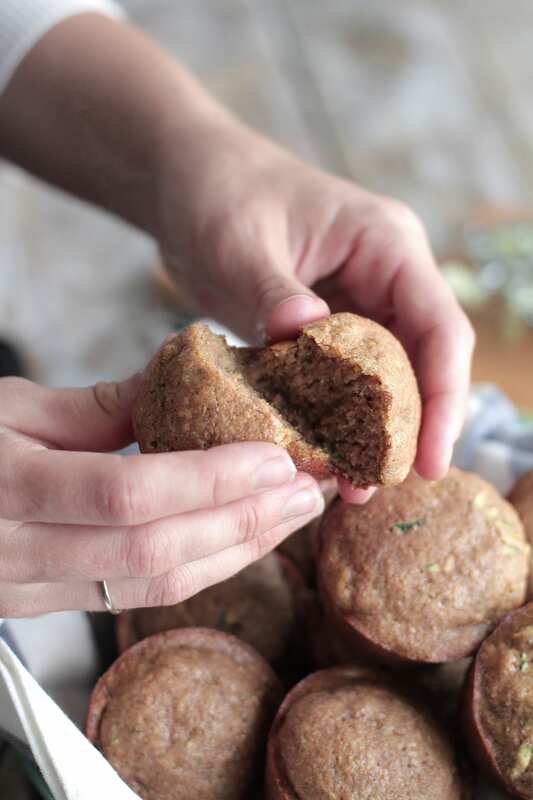 Hey Charlotte, The spices: cardamom, cinnamon, and ginger make the chai flavor in these muffins. these muffins look delicious and so moist! definitely could devour one right now.. love the chai flavour! Thank you, Thalia. They are so delicious and moist!! Enjoy. Could you use coconut milk instead? Hey Debbie, I would try. I think it will work. Looks delicious! I was wondering if I can replace the sucanat with something else….maybe honey or maple syrup? Hey Sandy, I believe honey can be subbed for the sucanat in this recipe. You’ll probably need to play around with the actual amount of honey subbed due to the liquid consistency. Enjoy!! Hi, these look fantastic! Has anyone made these to be GF at all? Hey Bea, Thank you. 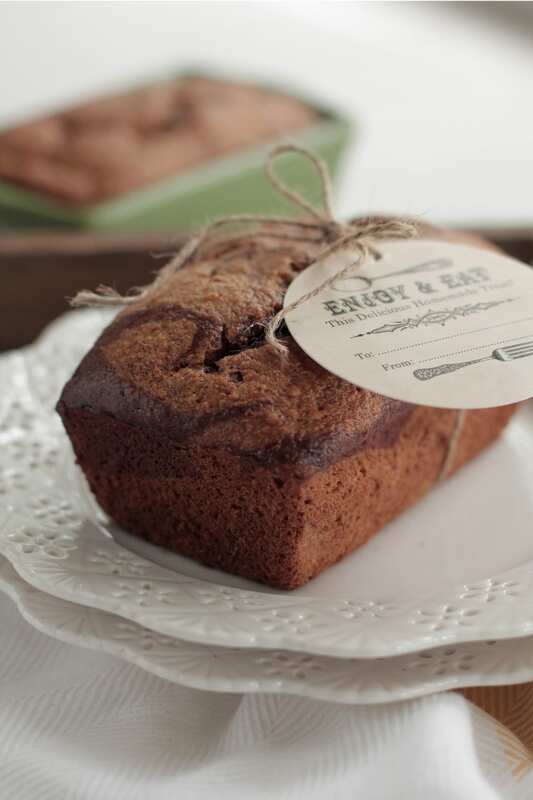 You could try using the Bob’s 1:1 Gluten Free Flour in this recipe. I am new to the blogging world. Is it okay for me to copy and paste this recipe post as long as I link it to you? Hey Jodi, Thank you for asking and congratulations on your blog! Technically recipe ingredients are not copyrighted, but bloggers typically don’t like their recipes copied and pasted due to the amount of time it takes to create new recipes. Instructions are copyrighted and so are pictures. The most considerate way to write a post about a recipe from another blog is to write the post, take your own pics, copy the recipe (if using the exact amounts), and then provide a link over to the original recipe for readers to find the actual instructions. Do you wring out your shredded zucchini? Andrea, For this recipe I don’t wring out the shredded zucchini. I just add it straight to the muffin batter. Perfect! I made these today and ended up with almost 2 dozen muffins. 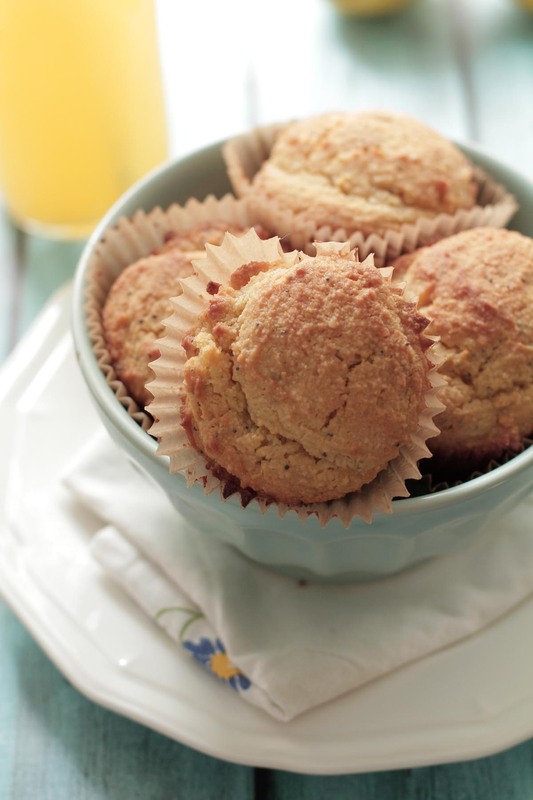 The muffins are so delicious – light and fluffy with just the right touch of sweetness. I left out the sugar and used just shy of 3/4c honey with no other modifications. Thank you for sharing such a wonderful recipe. I’m so glad you like them, Liz! Hey Danya, Yay! I’m so happy the recipe helps with your surplus of zucchini :). 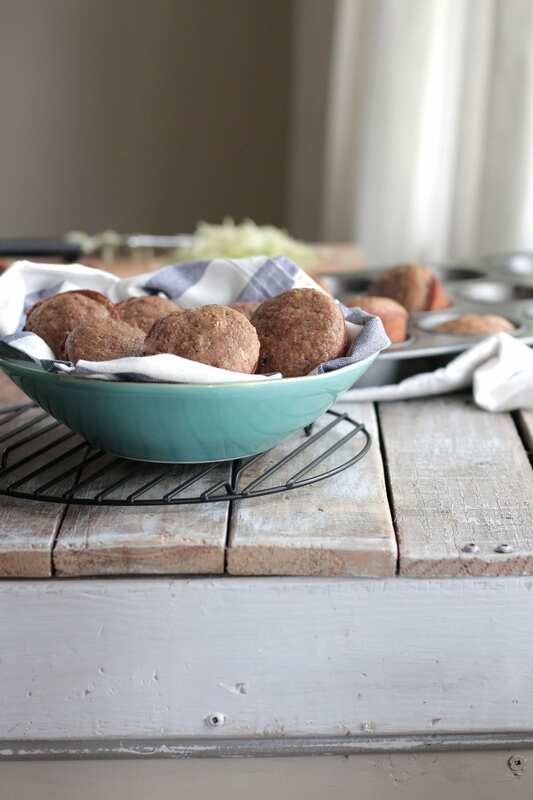 This is one of my absolute favorite recipes on the blog! 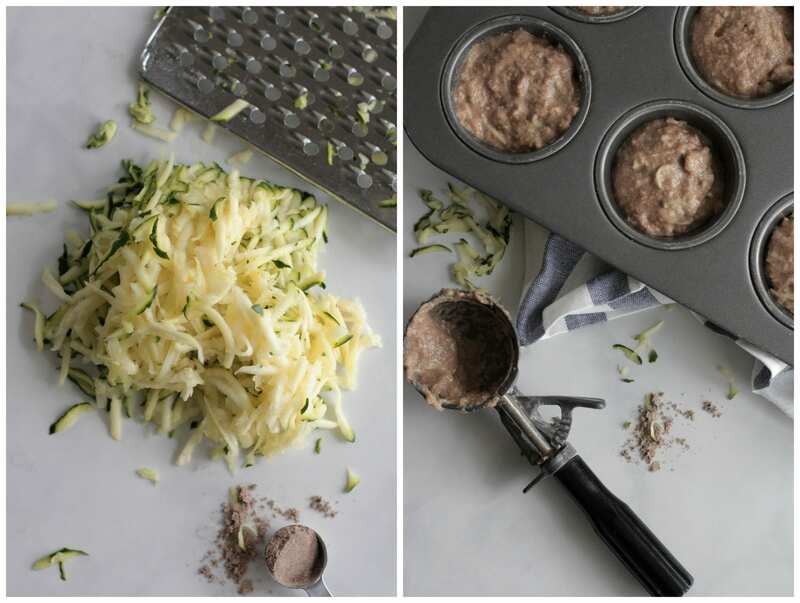 You could follow the method in this recipe and just add the zucchini and additional spices after the soaking period: http://gnowfglins.com/2009/11/04/basic-soaked-muffins/. Let me know how it goes! These are so delicious. I soaked thelis recipe with the greatest success. I just used whole wheat pastry flour and added 1/4 Cup of Sweet Whey (from yogurt) and milk after I cut in the butter. Next day add everything else and bake for about 30 minutes. Light, fluffy, soft, and spicy. My soon to be two year old wanted to eat them all day, which is something. That’s awesome, Bethany! I love that you’re converting these recipes over to soaked versions…so cool! Keep it up! I can’t wait to make these! I was wondering is coconut sugar could replace the sucanat? Thank you! Hey Andrea, Yes, you can sub coconut sugar in place of the sucanat :). Enjoy!! 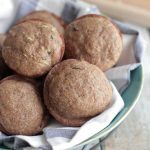 Can I use the eikhorn flour instead of whole wheat? Hey Ayn, Yes, but you’ll most likely need to adjust the flour amount a bit. 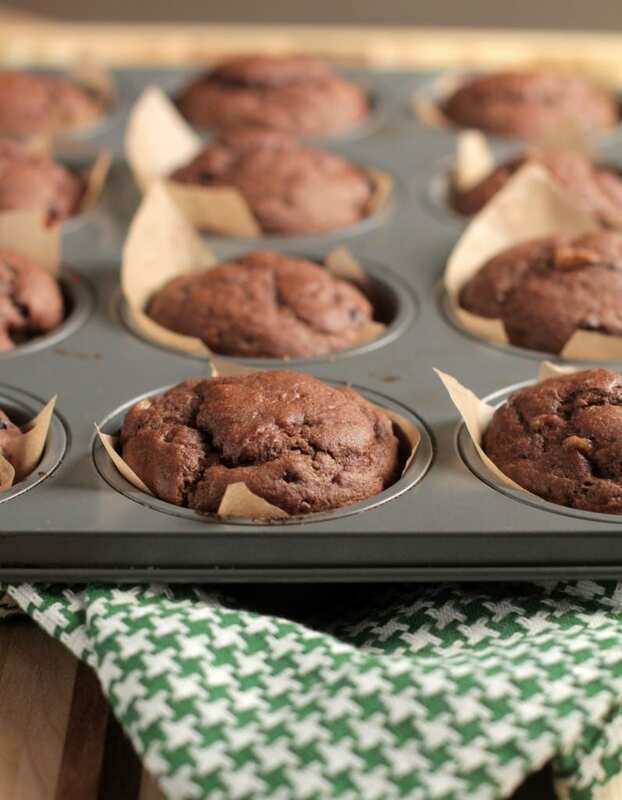 Definitely add these to your muffin Arsenal! Made these with a few changes and they were delicious! Used Mykos Vegan Butter from TJs instead of regular butter, subbed coconut sugar for the sucanat, and used pumpkin pie spice because I didn’t have cardamom. Yay, Lia. I’m so glad you’re enjoying the muffins.